The first time you sit down to set up a cloud connector in Eloqua, you may feel pretty intimidated—it looks scary! But, although there are a lot of steps to configure, especially for the first time, it’s really not as scary as it seems if you keep some key tips in mind. You probably know that a cloud connector is a tool that is added to Program Builder or Campaign Canvas to execute a specific function, such as webinar registration or an attendance query. To help you understand the process, let’s look at how to build a webinar cloud connector campaign; it’s something I do quite often for DemandGen clients. Every campaign is a little different, of course, and every one comes with its own complexities! But with a best practice approach, you can avoid problem areas and alleviate many headaches down the road. Tip #1: Get all the Logins and the most current documentation up front. Setting up these logins this way is something a lot of people don’t do; they create cloud connector setups within their own accounts. Why is this a bad idea? Well, if (1) your password changes, or (2) your account is ever disabled for some reason, or (3) you leave the company, the entire program would stop working completely. Probably not a good thing, right? Also, ask your webinar vendor for the latest documentation. Documents that exist on the internet regarding cloud connector setup can be years out of date. Things change frequently, so be sure to ask for the current version. Your account rep should have it right at hand. Tip #2: Create a test webinar ASAP. Create a test webinar as soon as possible, to give you the chance to discover possible issues before you build the final solution. It’s typical for people to want to just test the real webinar, but then you’ll hear “we don’t know who the speaker is yet,” “we haven’t set the date,” and so forth; more and more time is passing, and you can’t finalize the details in order to test. The point of the test webinar is to get ANYTHING up there right away so you can start playing with the cloud connector and identify concerns that could affect the whole design later on. Tip #3: Always use a custom data object (CDO). If it is an option within the cloud connector configuration for field mappings, always use a custom data object. Yes, it’s possible to use the contact record, but using a CDO is strongly recommended because you never know when you might have two webinars running at the same time, and if you use the contact record you cannot do more than one at a time. (Now, I hear you thinking, “I only run one webinar a quarter so I don’t have to worry about that”! I can’t tell you how often I hear that. . .then before you know it a new product/service or some special announcement comes along, and then panic sets in.) Another reason not to use the contact record is the need to write registration data to it. Many cloud connectors give you back information after registering. If you have 20 fields come back after registration, you don’t want to create 20 fields just for the contact record. So, overall, it’s just a really good idea to use a CDO and then you’ll be able to reference historical data. Tip #4: Test with multiple accounts—not just one—and check your settings. Do tests with multiple accounts, with each account performing different actions, so you can get a sense of what might go wrong in more than one scenario. 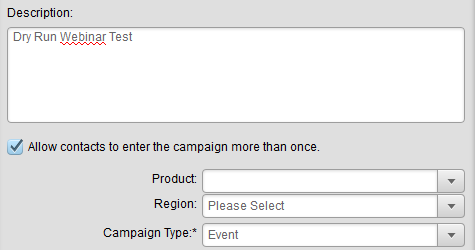 And make sure your campaign canvas/program builder is configured to send the same email to the same recipient multiple times during the testing phase. For example, by default, Eloqua only lets a contact receive the same email once; if you go through the test process and are not getting the emails, it’s a setting you have to change. Tip #5: Use webinar vendor email confirmation. First, as two servers talk to each other, a time lag occurs. 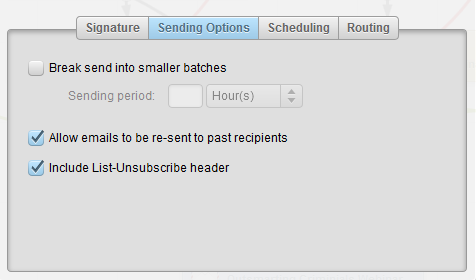 So if you use vendor confirmation, the person registering will receive email confirmation more quickly. Second, most vendors’ software creates the email confirmation for you by default, so it may be extra effort to create it all over again in the marketing automation system. Third, you don’t get any marketing value from knowing someone got an email confirmation—you wouldn’t evaluate it as part of lead scoring, for example—so that data doesn’t need to be in your marketing automation system. Tip #6: Make “Add to Campaign” part of registration processing. Tip #7: Track attendance/non-attendance with Shared Lists. Use Shared Lists to keep track of those who registered and attended versus those who registered but did not attend. Often, when you’re building segmentation to find out who to invite to your webinar, you may not think about inviting past webinar attendees—although there is a much higher chance that those people will come back to another one. It’s common to look at people who have shown interest in this or that product, but really, the best targets are people who enjoy webinars and have a history of attending previous webinars. Along the same lines, identifying those who registered but didn’t attend also has value for future segmentation purposes, such as sending different post-event emails: perhaps a special offer to those who did attend, and inviting those who didn’t attend to view a recording or register for a different event. These tips have proven successful in several integrated campaigns to drive webinar registration and attendance for DemandGen client firms. Give them a try and let me know how they work for you. Vince Farina, Senior Web Developer/Implementation Specialist with DemandGen, has several years of experience setting up successful Webinar campaigns. He has worked with a multitude of different Webinar platforms, including GoToWebinar, WebEx, ON24, and ReadyTalk. He continues to help DemandGen clients plan and implement integrations with Eloqua and Webinar technologies, while providing advice on how to manage the nuances and challenges that each platform can present.